Super PAC is a fun thing to say. Super PAC! It reminds me of the colorful action words in comic books. And in many ways, the impact of Super PACs this election will feel like a cartoon-style punch. To date, nearly $350,000,000 has been raised, and that number is quickly growing. Despite the influence Super PACs will have in the upcoming U.S. election, the majority of Americans don’t know much about this new source of outside money. Clearly, it’s not clear what Super PACs are all about. And I think it’s safe to say that’s by design. Super PAC TV ads look and feel like official campaign commercials, and all the PACs kind of sound alike (Restore Our Future, Winning Our Future, Majority PAC, House Majority PAC). As comedian Stephen Colbert illustrated with his Super PAC Americans for a Better Tomorrow, Tomorrow, it can all feel a bit silly. In February, Dan Siegel and I met in an MIT Media Lab class called Social Television. The course, taught by Henry Holtzman and Marie-Jose Montpetit, explores how technology is changing the way we view and define television and its future. Dan and I were both interested in creating a social TV experience around the 2012 presidential race, and created Super PAC App in response to the millions and millions of dollars being fueled into TV advertising. It’s predicted that voters in swing states will be watching back to back to back political ads this election. It may be all they see during the nightly news hour. Super PAC App is a free download in the App Store. Our goal is to educate and engage average voters in a fun and simple way. When a presidential ad comes on TV, just hold up Super PAC App, and find out what’s going on. Users can quickly discover who and how much money is behind the ad and the claims being made. Plus, there’s the opportunity to rate the ad (love, fair, fishy, or fail). TV advertising is traditionally a very one-way experience; sound and images coming at the viewer. 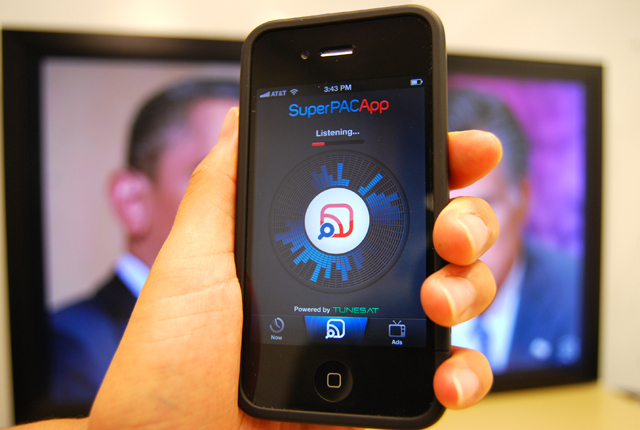 We’re hoping Super PAC App will encourage voters will tune in, instead of tuning out.